Definitely comfort food, this risotto is deliciously creamy without using any cream and the crab suprisingly blends into the dish rather than being an overpowering component. Don't be turned of by the thought of having to peel and cook crabs, I purchased fresh crab meat already picked and packaged and the whole dish takes 30 minutes from start to finish. So delicious and simple. This is a must try. Slice the onion, celery and the fennel bulb as finely as you can. (I used a mandolin). Reserve half the fennel for later. You can do this step whenever you like during the cooking process, but i will put it in the beginning. Take half the fennel, basil and the parsley leaves and combine with olive oil and juice of half a lemon, season with salt and pepper. You will use this salad on top of the risotto at the end. Place a large saucepan on a low to medium heat. Add the butter, a splash of olive oil to the pan with the onion, celery and fennel. After a minute add a splash of water. You want the mixture to soften but not brown so mix and keep adding water as you go. In a separate pan bring the broth to th boil, then turn heat to low once boiled. Once the mixture is very soft add the rice to the pan and stir until the rice is translucent (about a minute). Then add the wine. Add a ladle full of hot broth to the rice and stir until absorbed. Keep doing this until you have used about two-thirds of the broth. The key is to keep stirring. Be patient, it really only takes 15 minutes. Add the crab meat to the rice at this stage then keep adding the broth until the rice is just cooked and the risotto has a nice oozy consistency. If you run out of broth and the rice is not cooked just use boiling water. Take the pan of risotto off the heat and stir in the juice of half the lemon. Taste and season with salt and pepper. 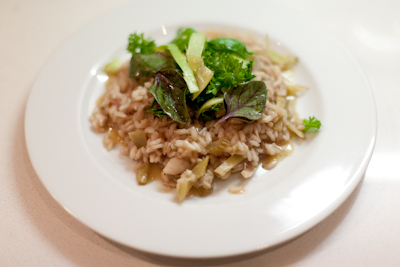 Serve the risotto with the parsley salad on top. With upcoming (one month) anniversary of Malvina's blog, the husband said: "Let's celebrate the blog's first six months with a nice BBQ dinner next weekend"